A philosophy of Hennebery Eddy is to take a net-positive design approach to our projects to have a positive impact on building occupants and the environment. By designing high-efficiency buildings, lowering water consumption, adapting existing structures for new uses, and carefully choosing high-performing, renewable, and low-toxicity materials, buildings can realize better energy performance. Hennebery Eddy has used the DDx tool to track energy use across our portfolio of projects since 2015; as a result, our firm can see where we’ve made progress and where there is room for improvement. In addition to signing the AIA 2030 Commitment in 2015, Hennebery Eddy has partnered with Energy of Trust Oregon (ETO) since 2011. ETO offers monetary incentives for clients who successfully implement sustainable design measures into their buildings. The incentive program is successful in making high-performing architecture, which can come at a premium, more accessible by offsetting the costs of robust building envelopes or additive features. Building owners with a record of energy data and participation in the ETO incentive programs are also able to market the sustainable elements of their building, in some cases creating demand for leasable space or higher lease prices. To share what we have learned over the course of three months, the five Net Zero Emerging Leaders interns will give a presentation April 11 at AIA Oregon/the Center for Architecture as part of Design Week Portland. All of us were tasked with the role of “DDx Ambassador” at our firms, giving us contact with members of project teams and sustainability advocates. Learn more and register for the presentation. 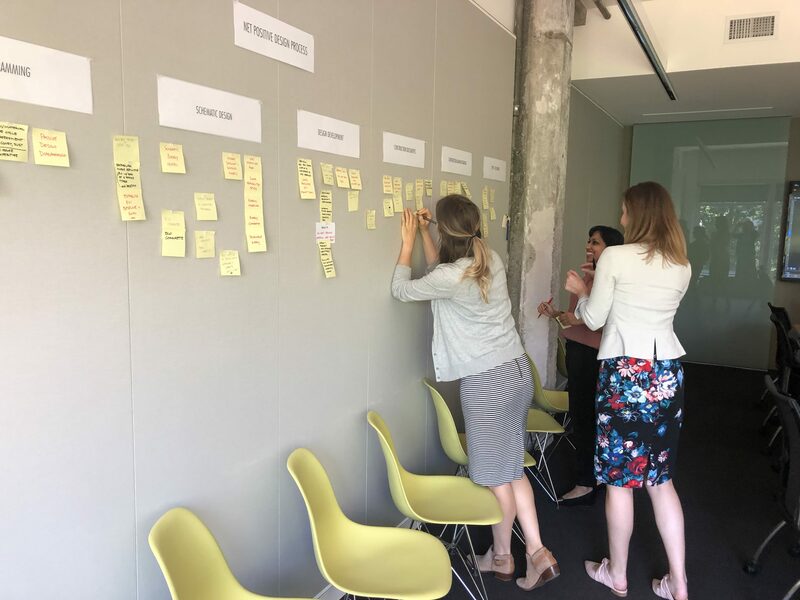 Members of the Hennebery Eddy Sustainability Committee audit areas for improvement in the firm’s net-positive design process. 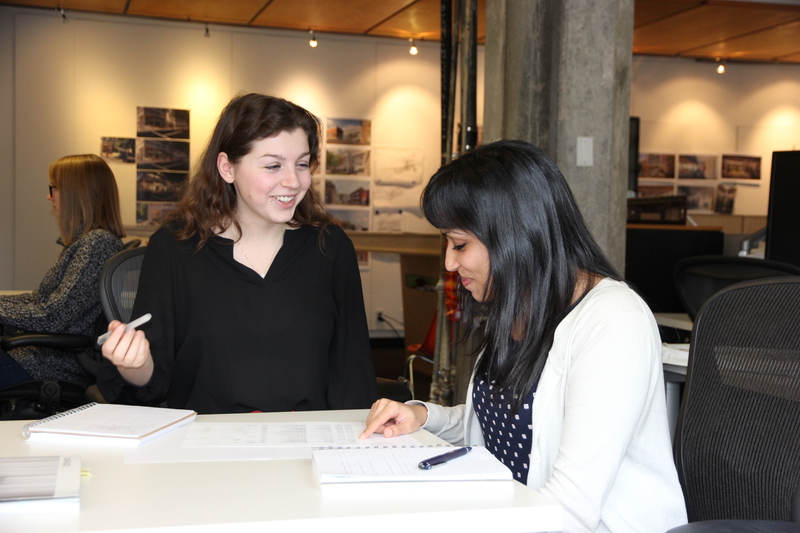 The Net Zero Emerging Leaders internship has provided our intern group a unique opportunity to understand how architecture firms of various sizes approach tracking energy use and their sustainable design processes. A message that I take away from being a part of this internship is that the data, or the output of a building’s energy performance, is intended to be shared and analyzed. This program is successful because it provides a platform for firms to connect and compare methods of energy modeling, data tracking, and sustainable design work flow. Not often are large and small firms connecting about energy modeling, and one reason for this internship program was to initiate that contact. As a student, it is helpful to learn alongside the firm about new ways of modeling during the early stages of design and calculating energy use. Similarly, the reports from DDx are successful tools to start the conversation for firms looking to reduce overall energy use intensity. Reports can be created to show how each firm is performing in relation to other firms. A positive feature about reporting is that firms are anonymous, reinforcing the idea that DDx should not be treated like a competition in effort to create a higher performance standard overall. Sustainability is not a race; the Net Zero Emerging Leaders encourage industry-wide sharing data to improve energy reduction in all building types. The ability to point to a report of previous projects built and prove that the high-performing design can be achieved or surpassed is made possible with the DDx database. As an outcome of tracking our energy use intensity (EUI) targets and lighting power density (LDP) reduction over several years and many projects, Hennebery Eddy has implemented new processes to improve building performance. One example is our net-positive checklist, distributed to project teams to document and advocate for sustainable design decisions and tasks. The checklist makes it easier for everyone on the project team to understand the goals and progress of sustainable design, as well as knowing the EUI or LDP throughout the building process. Another method is conducting an eco-charrette at the early stages of the design process. The charrette is a documented conversation between clients, architects, and other consultants that quickly relays many ideas as a brainstorming session. Another goal of the internship program, shared by Energy Trust of Oregon and Hennebery Eddy, is to apply our knowledge gained in the office to our studies. I am particularly in favor this internship because I wanted to understand how practicing professionals apply sustainable design throughout the building process. University of Oregon does an excellent job of incorporating mindful and environmentally positive design in classes, and I was looking to get a glimpse of how architecture firms grapple with energy efficient design. I’ve learned how important it is to track energy use or lighting power density from the early stages of the project, which can be achieved through energy modeling. It is less challenging to mitigate the energy use throughout the design process, rather than in the final stages of design.